Villa of new construction, eco-friendly, equipped with photovoltaic panels and solar autonomous in the production of electricity and heat, fully furnished. In the heart the Roman countryside (Pomezia) nearby and well connected with Rome (20 minutes by car to the metro B), easily reachable from Ciampino Airport (approximately 30 minutes) and Fiumicino Airport(about 40 minutes), close to great shopping center of Outlet Castel Romano. 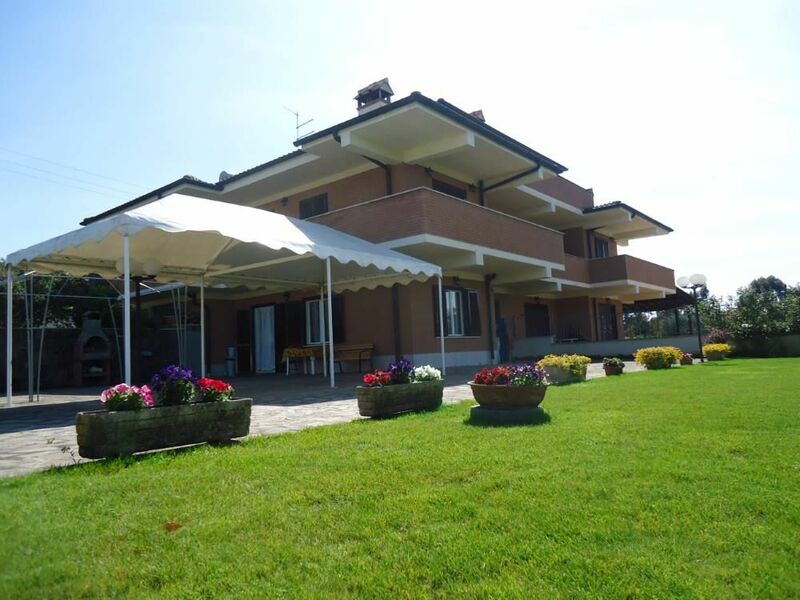 It offers the possibility of a pleasant and peaceful stay in the Roman countryside for family and friends. At the center of an ancient area, full of cultural, gastronomic and events traditional characteristics. Easy visit to to Rome, Ostia, Albano, Ariccia, Marino, Genzano, Ardea, Anzio embarking for the islands of Ponza, the Circeo National Park and Sabaudia. There are a few tens of km to the charming villages and castles Sermoneta, Ninfa called the Pompeii of the Middle Ages, Norma. Sandy beaches of Torvaianica are only 10 km. The garden welcomes guests in a green lawn and on the large landscaped yard can play table tennis, organize barbeque. Arranged on three floors, with large, bright kitchen, large living room with fireplace , six bedrooms and four bathrooms "
"We would like to thank Loredana and family for make use very welcome.The Villa was beatiful, clean and all the ammenitys that anybody would need.We would definatly book again. thanks Ian"
It was a very pleasant stay in this spacious villa. Very helpful and patient owners. The villa had everything you need from fresh towels to games for the kids. Thank you very much! Très belle villa, fonctionnelle, idéal pour groupe avec enfants. Grande piscine, table de ping pong, trampoline, le bonheur pour les enfants et les grands. Super accueil des propriétaires. La villa est idéalement située: proche à la fois de Rome et de la mer. Nous avons passé de formidables vacances à Pomezia. Tous les commerces à proximité dont un carrefour ouvert 24h sur 24 et 7 jours sur 7. A réserver sans hésiter. Una vera sorpresa trovare una casa così ampia e ben tenuta dove trascorrere in pace giorni di relax a due passi da Roma, che si può visitare senza l'ansia di entrare e uscire dagli alberghi e badare ai bambini. L'ampio giardino ha una piscina favolosa e pulitissima, si può stare in allegria al fresco, quasi non si ha voglia di muoversi. Mare e attrazioni vicini: Cinecittà world, Zoomarine, Outlet di Castel Romano. Pulizia e attrezzature della casa impeccabili. I proprietari persone accoglienti e affidabili, la casa confortevole e Attrezzata. Piscina favolosa! Siamo stati benissimo, posto tranquillo e bello a pochi km dal mare e da diverse attrazioni. Great house for large family! Great house for large family! We found this location very cozy and suitable for us. We had 9 adults and 4 children. House included everything needed, like outdoor grill, swimming pool and table tennis. There were enough bedrooms and restrooms for all of us and great shaded outdoor dining area. We were there during hot August weather but due portable fans inside temperature didn’t feel uncomfortable at all. Safe, quiet and private location with remote operated gate at the entrance. English speaking owners were very friendly people and easy to get along with them. You got lot of information of the surroundings like local restaurants, stores, and shopping malls etc. Location is great too, only 10 min away from big local grocery stores, approx.. 20-30min away from Tyrrhenian Sea beaches (at Torvaianica) and railway station 5 min. away. Approx. 30min away from the Fiumicino airport. Not too much stores or restaurants in walking distance but rental car will help to daily transportation issues. Thank Jaana and her family. We hope to meet them in our villa in the future. From Rome: Via Laurentina directly from the GRA until km 23,800 Civic 46. From Fiumicino motorway towards Rome to the GRA, take the outside lane, exit on Via Laurentina, Ardea direction. From Ciampino airport, reach GRA th. Via Appia and then via Laurentina towards Ardea. Tariffe scontate in relazione alla durata, Tariffe in funzione del numero di persone, Richiesto supplemento per il riscaldamento in base alla stagione, Deposito cauzionale, Caparra richiesta alla prenotazione, Consegna delle chiavi da parte del Proprietario, Proprietario non presente in loco. Tariffa pulizia finale €100,00 solo se necessaria.